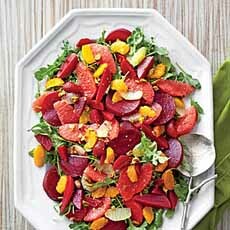  Citrus with beets and greens have eye appeal and taste great (here’s the recipe from Southern Living). Pretty as a picture (here’s the recipe from Today). An elegant take on ambrosia (recipe at right, from Fosters Market). 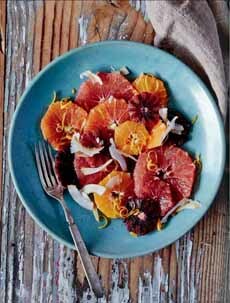 When cold weather limits the choices of both fruits and vegetables, a sprightly citrus salad can be a treat for the eyes and the palate. When you mix colors, the results are truly glorious. They’re pretty, taste and good for you! You can also add another colorful winter favorite, beets, to the salad. 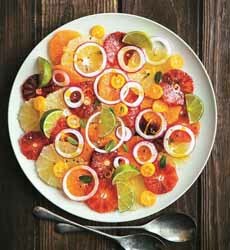 There are endless variations of citrus salads. Here are two classic combinations; elaborate on them as you wish. In Greek mythology, the gods ate ambrosia and drank nectar, fragrant foods that were typically reserved for divine beings. While no descriptions of either these foods survive (the word ambrosia means delicious or fragrant and nectar indicates a delicious or invigorating drink), scholars have long believed that both ambrosia and nectar were based on honey. The elegant recipe that follows (photo #3) is from Fosters Market Cookbook, recipes from a fine market and café in Durham, North Carolina. Here’s a recipe for another style of ambrosia from Alton Brown, with a sour cream dressing, pecans, grapes, mini marshmallows and more. 1. PEEL the citrus. First cut off the tops and bottoms with so the fruit sits flat. Then place on a cutting board and cut away the skin and pith, working around the circle between the fruit and the pith. 2. SLICE each fruit into rounds or half rounds, depending on the size. Remove any seeds. 3. PLACE on a large platter or individual plates, and sprinkle with any juice that has collected on the board. Sprinkle the dried cranberries/cherries and coconut over the top. 4. ZEST the lemon over the salad; then cut in half and squeeze the juice over the citrus. 5. SERVE, or cover and refrigerate until ready to serve. Hannah Kaminsky of Bittersweet Blog developed this recipe by browsing the produce aisle and picking up what was available. Grapefruit and avocado with macadamia nut dressing (photo courtesy Bittersweet Blog). 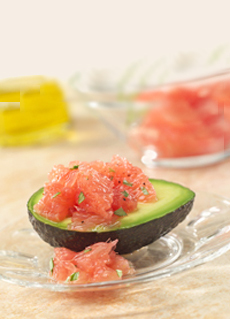 A pretty preparation: dressed TexaSweet red grapefruit segments in an avocado half (photo courtesy Texasweet). 1. MAKE the dressing. Combine the ingredients in a blender or food processor and purée on high, until creamy and completely smooth. 2. 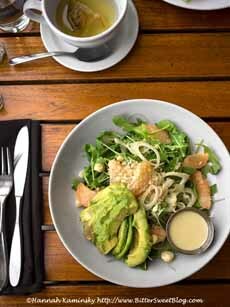 PLACE the arugula and fennel in a bowl and toss with the dressing; or if you prefer, serve the dressing on the side. Divide the greens between 2 or 3 bowls. 3. TOP with equal amounts of grapefruit, avocado, and macadamia nuts. Sprinkle with additional salt and pepper as needed, or simply place the shakers on the table for self-service. As a garnish on everything from vegetables to mains. Recipes from chiles rellenos to sushi.